Uno Chicago Grill: Summer Love with Lobster! Chicago is known for many wonderful foods. It's quite a food loving city with so many cuisines, styles and tastes. One famous food we're known for is Chicago Deep Dish Pizza. There are a few places that claim to be the first to offer this specialty pizza but Pizzeria Uno claims to have originated the deep dish pizza back in 1955. The company started franchising in 1980 and has grown to have over 150 Uno Chicago Grill restaurants found in 24 states, the District of Columbia, Puerto Rico, South Korea, United Arab Emirates, Honduras, Kuwait and Saudi Arabia. Now Chicago Deep Dish Pizza can be enjoyed worldwide! In 2005, the company changed their name to Uno Chicago Grill and expanded their menu to include other dishes aside from their famous deep dish pizza. We also enjoyed an appetizer that caught our eye. 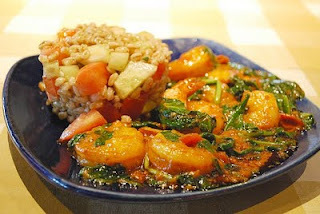 Among the summery dishes offered, the Shrimp Tikka Masala with Farro Salad stood out. It didn't quite fit the American fare the restaurant offered but we gave it a try. Surprisingly, it was very good and wasn't something we expected Uno's would have on their menu. 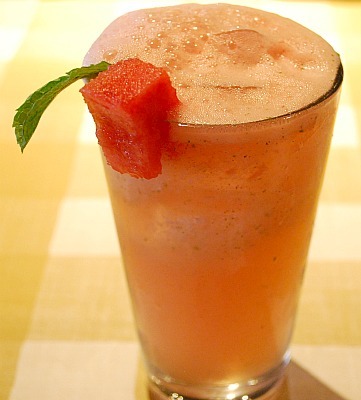 'Masala' is a mixture of spice found in classic Tandoori cooking. The flavor is similar to a tomato curry and this dish was served with farro salad: a whole-grain wheat with diced tomatoes, cucumber & balsamic vinaigrette. Although it was good, I don't know if Uno's should really include ethnic dishes on their menu. It can come across as confusing and it made me question what direction Uno was going when this dish became a menu option. Regardless, we were pleasantly surprised and didn't regret ordering it! 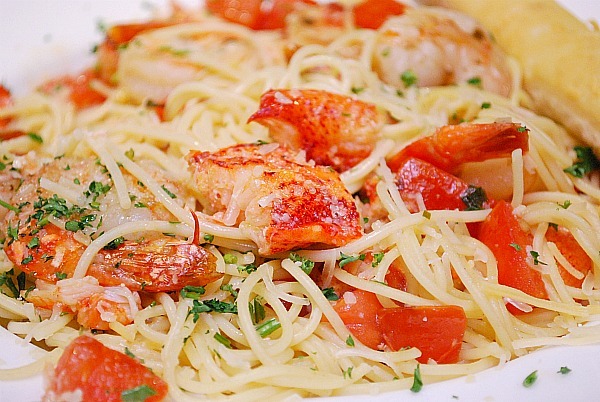 Now with Uno Chicago Grill's summer menu, there is definitely a love of lobster going on. We ordered two lobster dishes from their summer menu and wow, we were quite impressed. 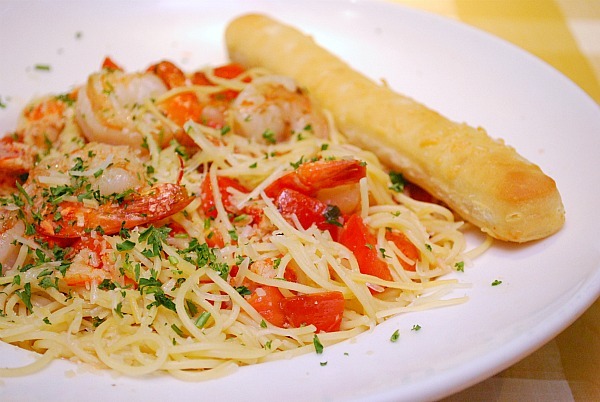 The first dish was the Lobster & Shrimp Scampi. We were impressed with the large, fresh chunks of lobster and large shrimp that studded this dish. The lobster and shrimp were sautéed with garlic, diced tomatoes and basil then tossed in a light white wine sauce on vermicelli with Parmesan. It was extremely good and made me feel like I was on the east coast with the abundance of lobster we were served. And for those that appreciate kid-friendly restaurants like us, even our little foodie Joel approved of his meal. 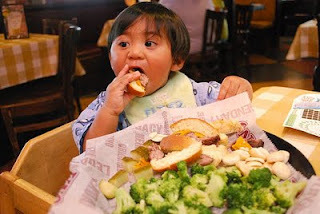 He was too busy enjoying his slider meal with broccoli to offer up his review... but I do know it was a positive one! Just when we thought we couldn't eat another bite, Uno's impressed us once again with dessert. Often times, towards the end of the meal, dessert is offered and usually they are large portions. Who really has room to truly enjoy such a large dessert portion after a meal? But here at Uno Chicago Grill, not only do they have their standard dessert portion sizes, but they also offer mini portions as well! We tried 2 mini desserts - Mini Chocolate Peanut Butter Cup and Mini Macadamia Nut White Chocolate Chunk Deep Dish Cookie Sundae. Below is the picture of the Mini Chocolate Peanut Butter Cup. This was truly decadent and I loved every bite! 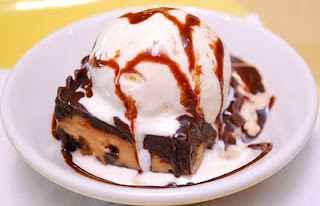 A rich warm chocolate and peanut butter bar is topped with vanilla ice cream and chocolate sauce... yum. As for the other dessert, it got eaten up before I had a chance to take a picture... so you know that was good too! So the verdict? 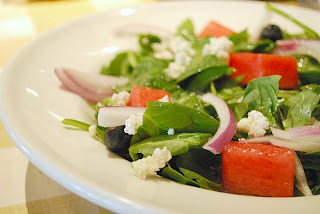 Well, although we aren't frequent diners of Uno Chicago Grill, we were quite happy with our meal and service. We already know they have really great pizza so it was nice to know and experience how they have expanded their menu to other dishes as well. 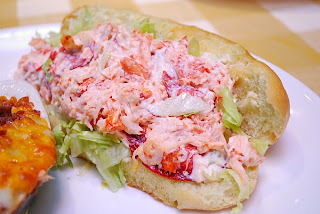 Their summer menu highlighting lobster is a delicious way to feature the lobster season and they do a great job! You'll definitely get a healthy portion and the dishes really compliment each other. Of course, if you haven't had a traditional Chicago deep dish pizza and you're not exactly in the neighborhood to try one, it's good to know that Uno Chicago Grill is available around the country and worldwide so you can have a taste of what started it all. Definitely check out Uno Chicago Grill if you have one in your area. We were pleasantly surprised and I'm sure you will be too! Full Disclosure: Our meal at Uno Chicago Grill was complimentary in return for my review. The honest opinions and review of our experience reflected are mine alone. Everything looks delicious! You had quite an adorable little dinner date!